Campbell Scientific is pleased to announce the upcoming release of EasyFlux™-DL, a datalogger program that enables a CR3000 to report fully-corrected fluxes of CO2, latent heat (H2O), sensible heat, and momentum from a Campbell Scientific open-path eddy-covariance (EC) system. Final fluxes are processed from raw time-series (10 Hz) data by applying commonly used corrections found in the scientific EC literature. In the past, Campbell Scientific’s open-path EC datalogger programs have provided estimates of fluxes by applying two significant corrections (i.e., SND and WPL) to the half-hour covariances. Although not fully corrected, these estimates enabled users to generally assess system performance and ecosystem response. When more-detailed analysis and fully corrected fluxes were desired, users were required to upload time-series data collected by the datalogger into a PC-based software application for processing. EasyFlux-DL now accomplishes this automatically at the end of each EC averaging interval. Besides saving time and effort, EasyFlux-DL now opens new possibilities for telemetry options since the flux output files are much smaller than the raw time-series (10 Hz) data files and can be transmitted using lower-bandwidth methods. Note that time-series data is still saved on the datalogger’s CompactFlash card as a backup in case reprocessing of data is desired at a later time. EasyFlux-DL will be released at the end of October and will be available as a free download from the Campbell Scientific website. 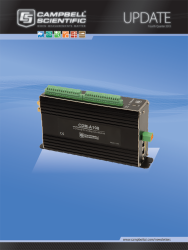 In its standard version, the program supports an open-path EC system based on Campbell’s new EC sensors: the IRGASON or EC150 and CSAT3A. It also supports the optional addition of a fine-wire thermocouple and Campbell’s standard suite of energy-balance sensors. Customization of the program by a Campbell Scientific application engineer to support non-standard sensors may be possible with a fee to cover programming time. Over the past several months, EasyFlux-DL has been piloted at several stations in various environments, including irrigated alfalfa, grassland, maize, open water, forest, and desert. The results have shown good agreement with fluxes processed using traditional PC-based software applications. Figure 1 below is a photo of one of the pilot stations. Figure 2 compares final CO2 fluxes from this station using EasyFlux-DL and a PC- based software application. We at Campbell Scientific are excited about the possibilities EasyFlux-DL provides in accessing meaningful flux data more quickly and lessening the burden of processing unwieldy raw data sets. Figure 1. 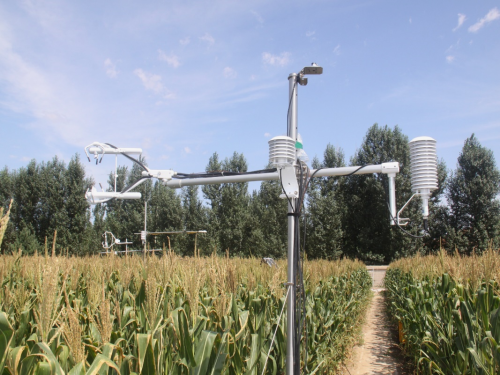 Fully-corrected fluxes are calculated using EasyFlux-DL over a field of maize in northeast China. Figure 2. CO2 fluxes over maize are calculated and compared using EasyFlux-DL and EddyPro (LI-COR, Inc., Lincoln, NE) after applying similar diagnostic and despiking filters to time-series data. Data shown represent half-hour fluxes taken over a three-day period in August.